While this sauce is ideally suited for roast beef or steak, it also tastes great on ham sandwiches. Fresh horseradish can be found in the produce section of the supermarket, usually cut into short lengths. Scrape the peel off the root with a sharp paring knife or vegetable peeler. Finely mince thyme and garlic with ½ teaspoon salt until it is reduced to a smooth paste. 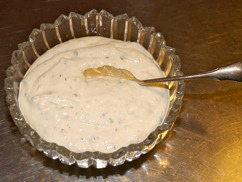 Transfer to small mixing bowl, stir in vinegar, and allow to sit for 10 minutes. Stir in horseradish, sugar, sour cream, and heavy cream; adjust seasoning with salt and pepper. Cover bowl and refrigerate at least 4 hours before serving. Check out Matthew Card's article "Get Saucy" for more great ideas on homemade condiments.